For those of you with multiple sites in your account, chances are there are a few sites that are lot more important to you than the rest. 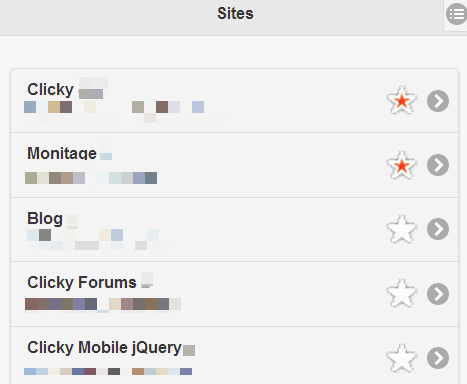 Now you can make sure these sites are always at the top of your user homepage for quick access, on both the desktop and mobile versions of Clicky. 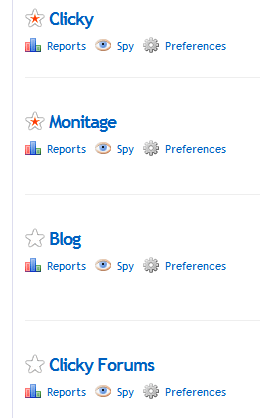 Flagging a site as a favorite works just like the other reports. Click the star and presto, it's a favorite. Click it again and it's no longer a favorite. If you need a moment to pick your jaw up off the floor, please take it. On the desktop there are options to sort your sites by something other than alphabetically, such as visitors or bounce rate. When you use favorites, the same sorting rules will still apply, but divided into the favorite and non-favorite sites. In these screenshots that sorting is default (alphabetical), so you can see that the favorites are at the top sorted by name, then the rest are below them also sorted by name. Happy to see enthusiasm for such a simple little feature! But I agree, it's nice!